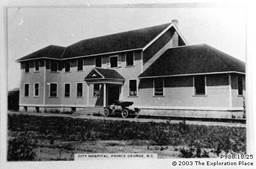 The Auxiliary was first started in August 1919 to primarily raise money to support a new privately owned hospital located on eighth Avenue in Prince George. Mrs Cowie, the first President, was a driving force, building the Ladies Auxiliary. With much enthusiasm they set out to raise money mainly for linens, drapes, and other incidentals. After the flu epidemic in 1918 a move was started to build a proper City Hospital, but it was not until 1920 that this dream came to fruition. It was to be known as Pine Manor, and was located at the NE corner of 13 Ave and Alward Street. During the 1930 depression, as money was scarce, members worked even harder going by horse and buggy collecting produce, storing donations in root cellars and preserving the rest for patients. 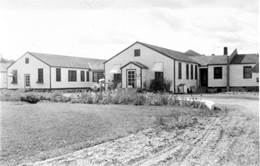 During the Second World War the Auxiliary did not hold regular meetings or carry on with fund raising social events but under President Margaret Lund they were able to carry on hospital services. Following the war, Jessie Cunliffe became President and the Auxiliary was reorganized. With the expansion of the city after the war, the old hospital was outgrown and with the availability of the military hospital, plans were made to move. So in 1947 the hospital moved to Laurier and Lethbridge Streets to the Army Barracks. With the introduction of Hospital insurance in the late 1940’s the Auxiliary’s role changed. Linens and produce were no longer needed and the Auxiliary started purchasing smaller types of equipment such as oxygen tents, bottle warmers, furnishings and incubators. Many fund raising projects were organized. The Auxiliary became well known for their many FANCY DRESS BALLS AND FASHION SHOWS!! In the late fifties it was very evident that a new and better hospital was needed. The Auxiliary, as part of the Hospital Board, played an important role in helping to organize a Regional District. With this in play, plans slowly evolved and In May 1958, the sod was turned for the new Prince George Regional Hospital which was located in its present location. In 1959 the First Thrift Shop was opened. It was located at the former RCMP station on seventh Avenue. It was widely advertised by CKPG, one of its biggest supporters. That year CKPG donated 1500 records and did free advertising on the radio. 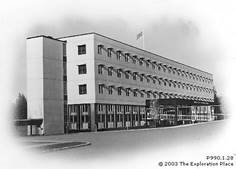 In 1960 with the opening of the hospital, the newly named Auxiliary to Prince George Regional Hospital opened a gift shop located in the main entrance area. In 1961 the Chapel and quiet room were opened and was operated until 1969. Also in 1961 the first Bursary was given to students entering the medical field. This practice continues today. In 1963 a Voluntary Services Committee was formed and 17 different services were organized and functioning by 1970. Many changes have taken place since the Sixties! No longer are there Balls, Fashion Shows, or Raffles to raise funds. The Gift and Thrift shops now raise funds to help purchase hospital equipment. As well, there are many volunteers performing many services at the hospital, helping patients, visitors and staff make their day just a little more comfortable. Although, over the years, the Auxiliary has raised over $4,000,000.00, which continues to this day, it is the giving of comfort and joy to our patients and visitors that makes us feel successful. This far exceeds any amount of money provided.